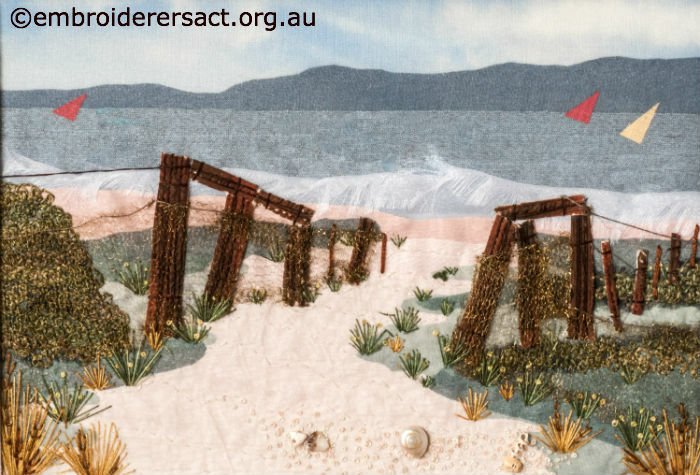 In this gallery it’s wonderful to see how different people have interpreted Glenys Leske’s Path to the Beach so that each work is quite individual even though the basic elements are the same. 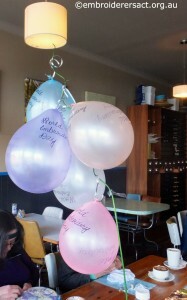 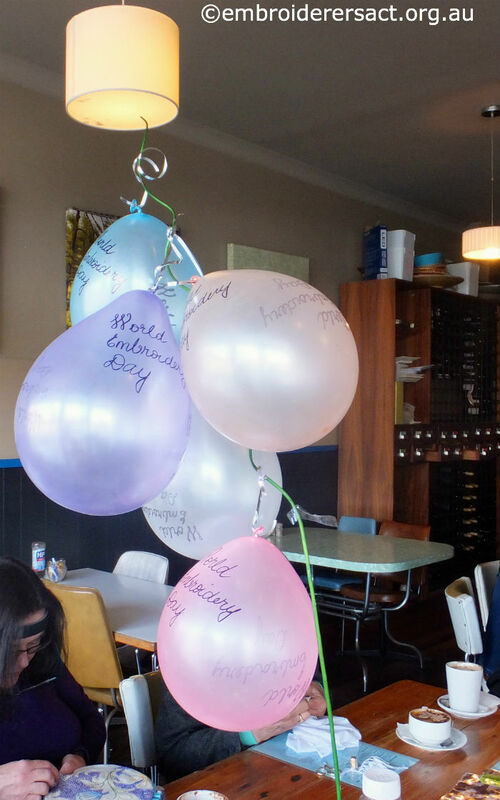 Here’s a taster of the photos uploaded…. 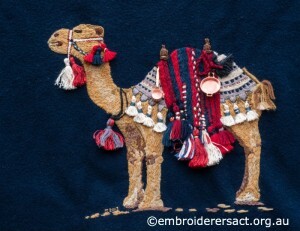 Enjoy and hope you’ve having a great weekend! 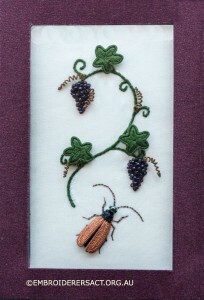 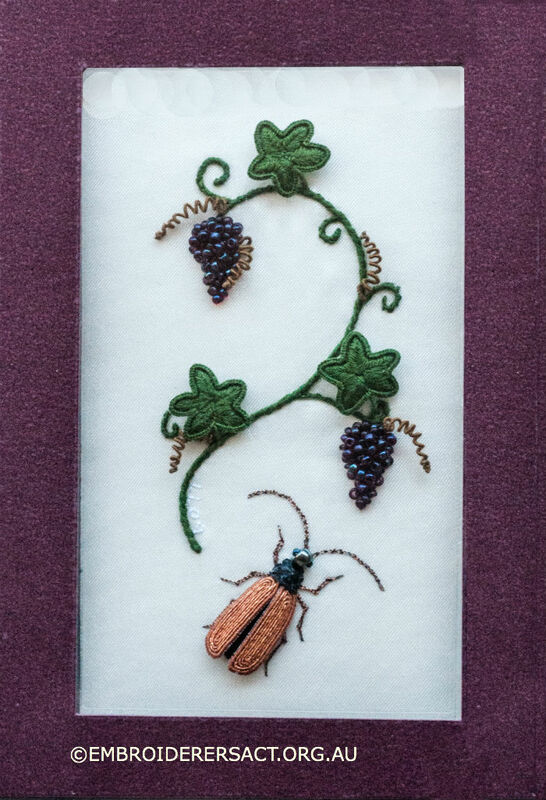 I’ve previously used the adjective sublime to describe the stumpwork of Lorna Loveland here. It’s not a word to be used lightly but it absolutely also applies to this exquisite piece of needlework stitched by Marjorie Gilby. 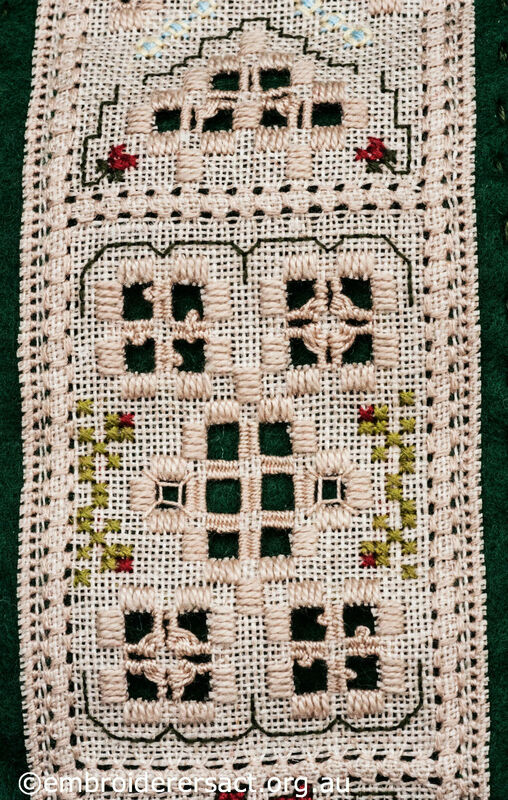 This piece has a really interesting history. 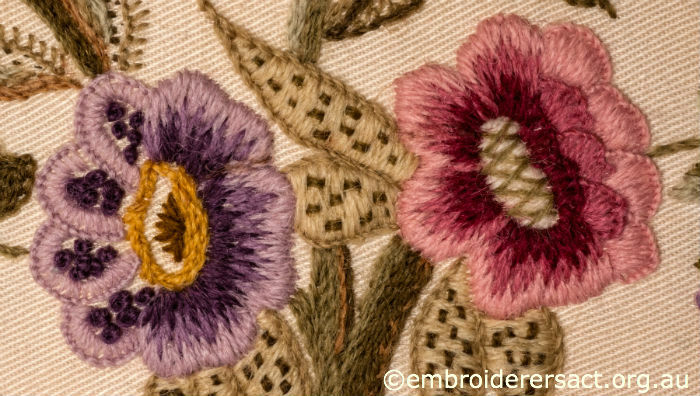 It’s a reproduction (with some variations) of a piece of Mountmellick designed and embroidered by Miss S. Docker around 1912-1913. 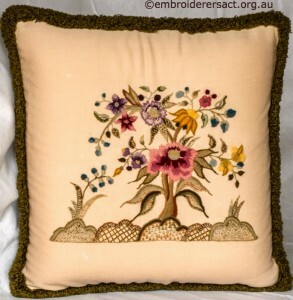 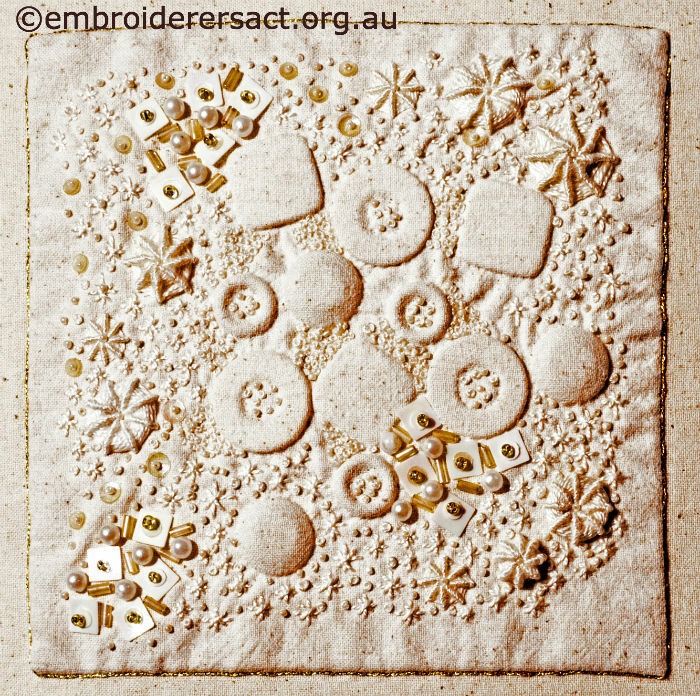 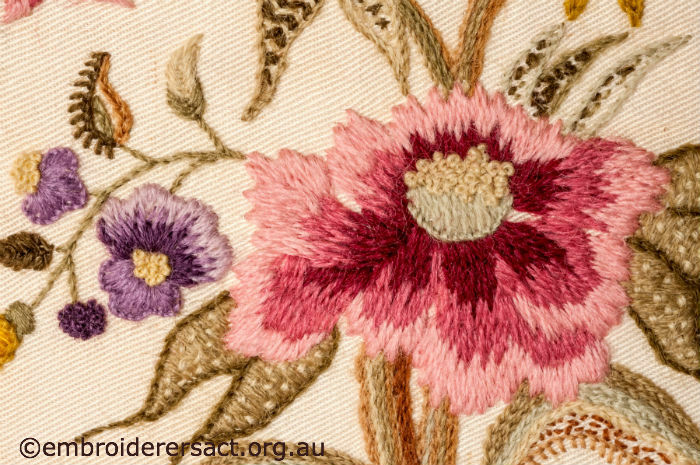 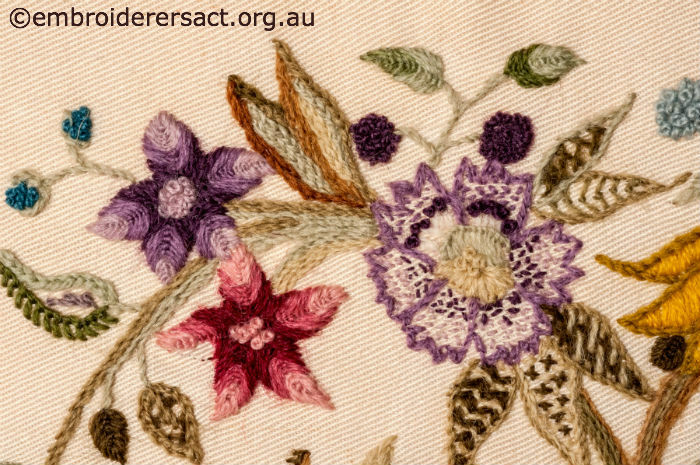 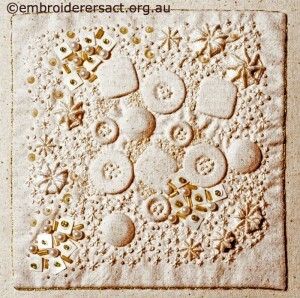 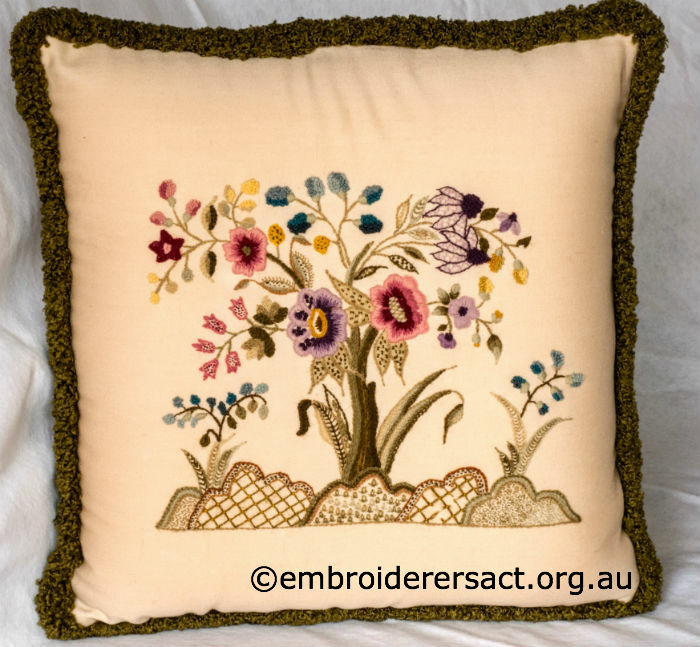 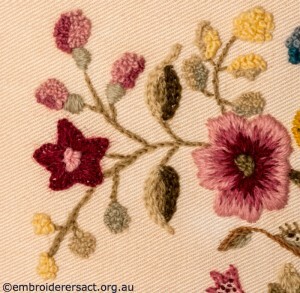 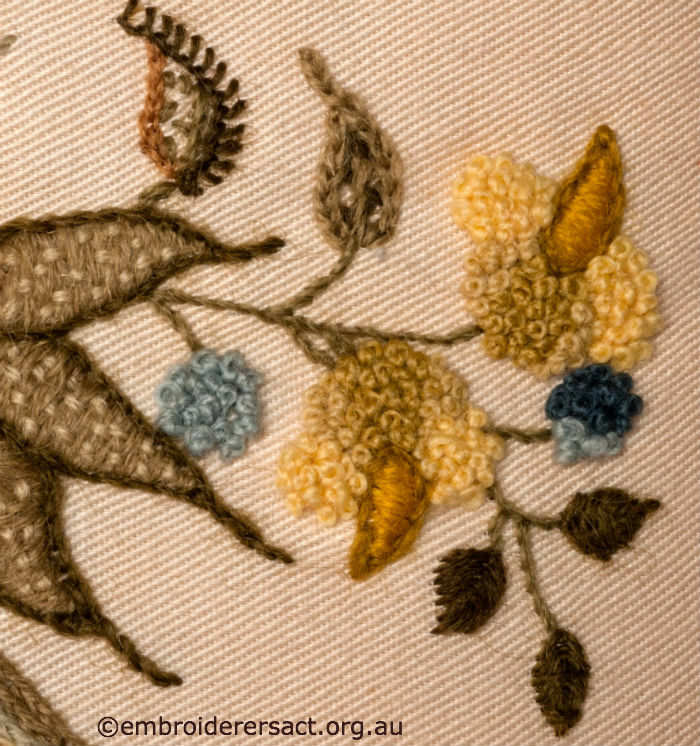 Marjorie got this design from the book Australian Heritage Needlework Wildflowers edited by Jennifer Sanders which includes a range of wonderful colonial and early twentieth century designs. 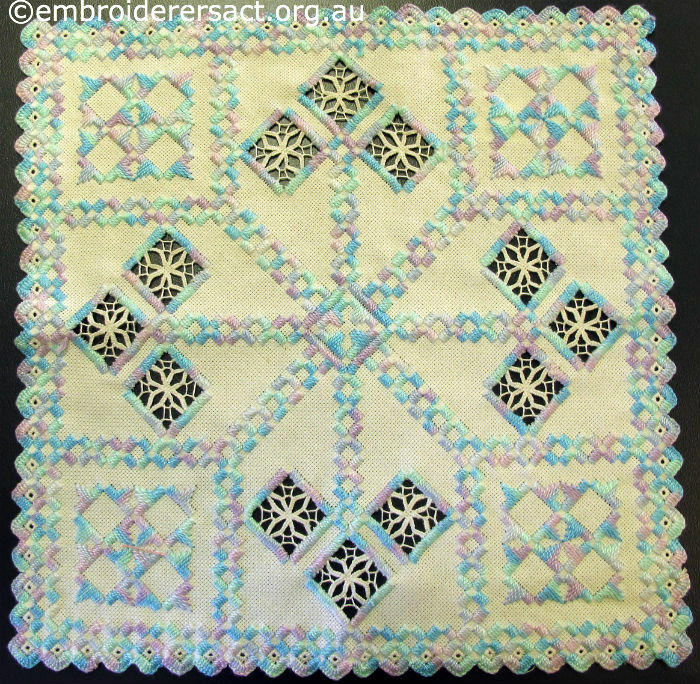 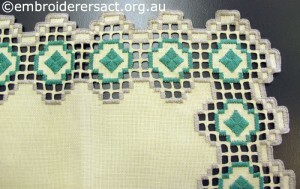 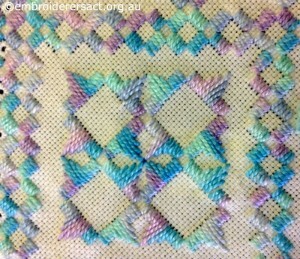 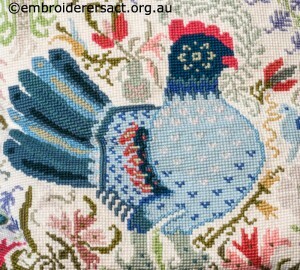 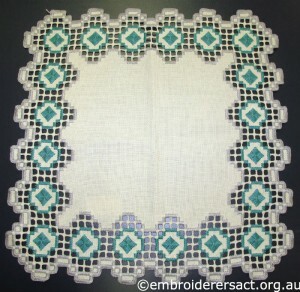 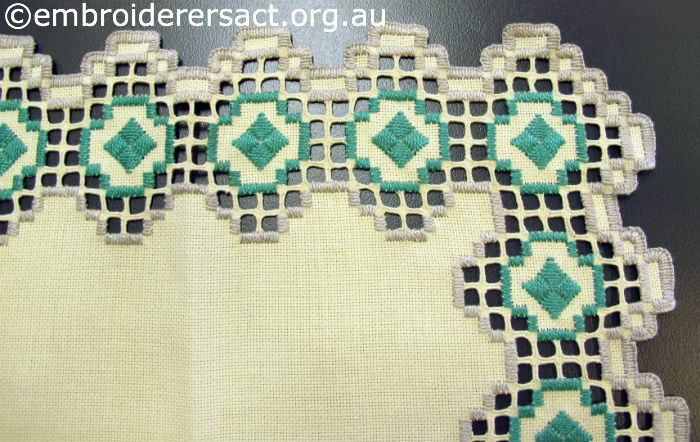 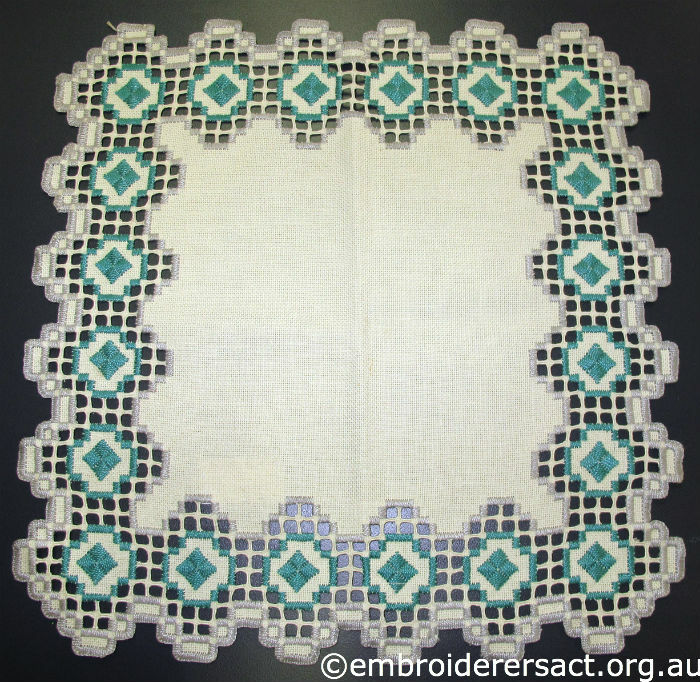 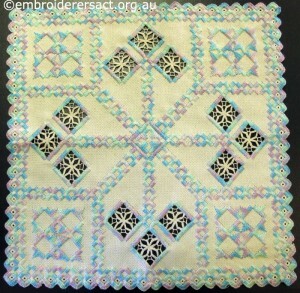 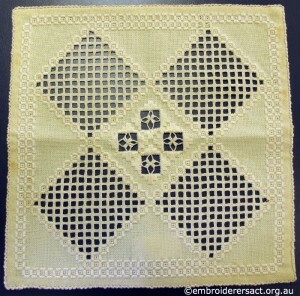 This particular design is The Waratah Tray Cloth and it was contributed by Ann – Marie Bakewell. 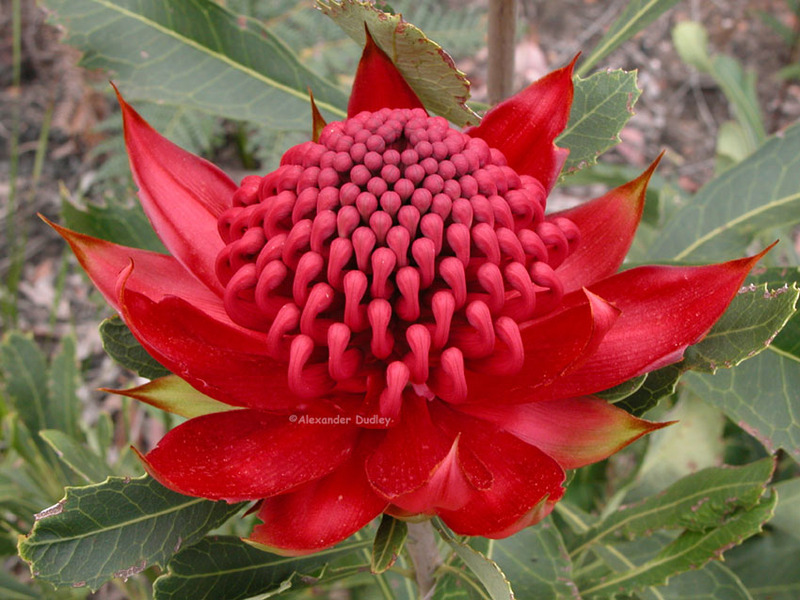 For those readers who don’t live in Australia a Waratah is a spectacular native flower and the floral emblem of New South Wales. 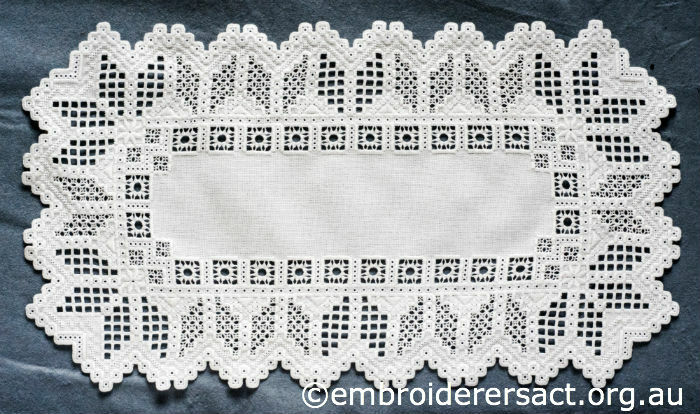 Mountmellick is a type of Whitework embroidery with floral motifs that developed in the Irish town of Mountmellick around 1825. 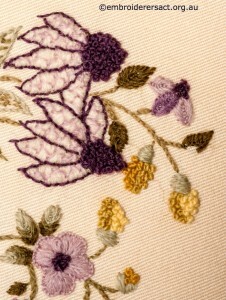 It uses predominantly knotted and padded stitches to create a richly textured surface. 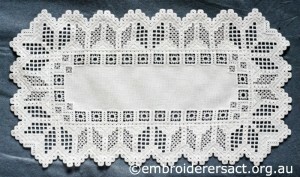 Traditionally it’s worked in a white matt thread on white cotton satin jean fabric. 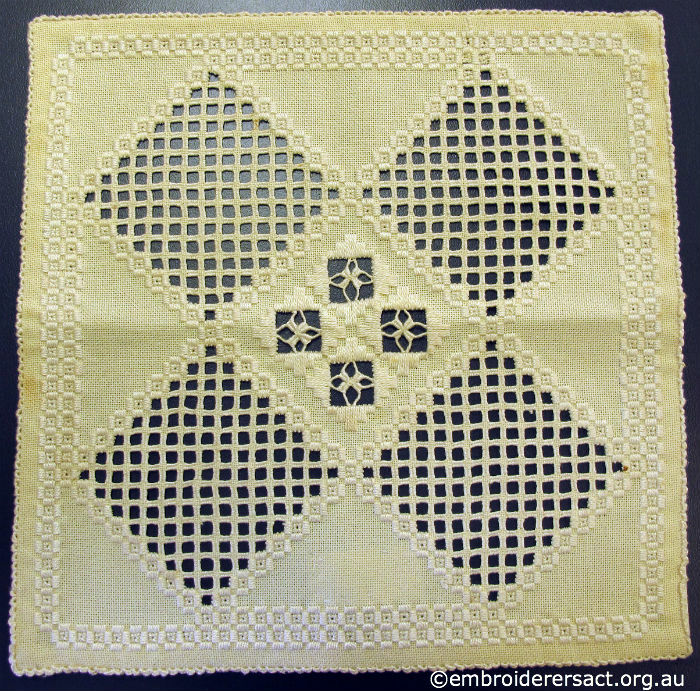 Mountmellick was popular in Australia at the turn of the century for those household items that needed frequent washing. 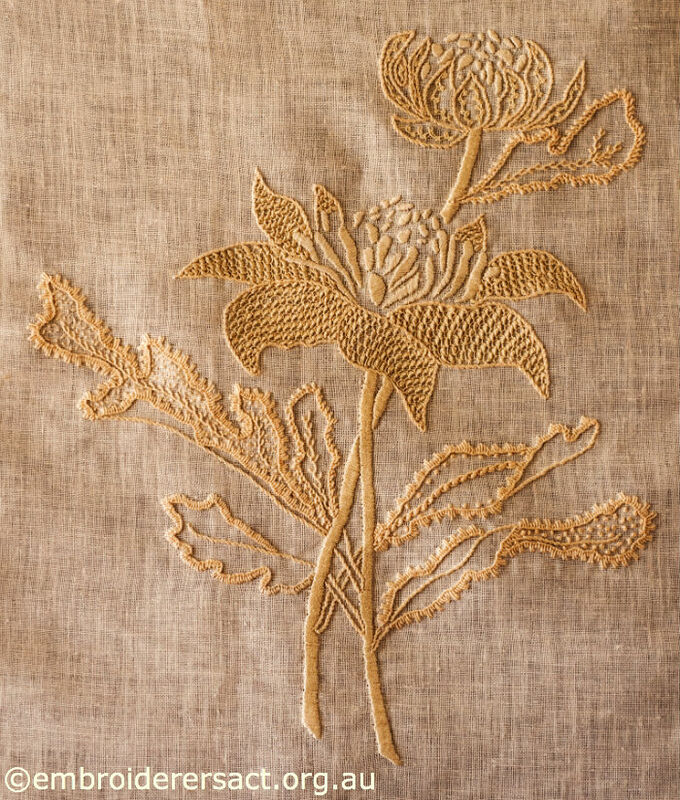 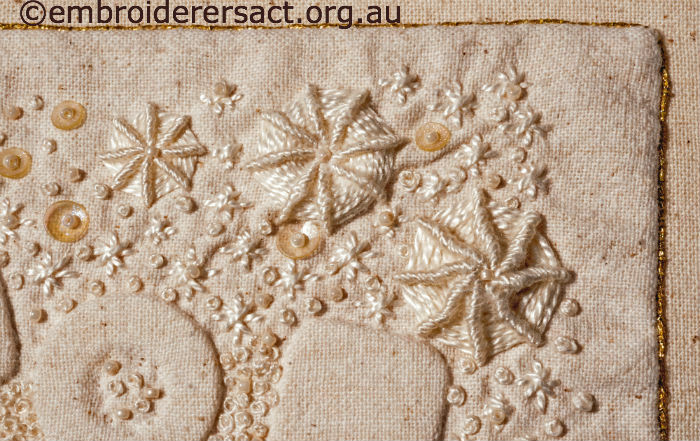 Whitework generally was also fashionable and the motifs used were often nationalistic and featured designs based on local wildflowers. 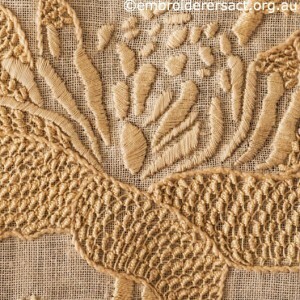 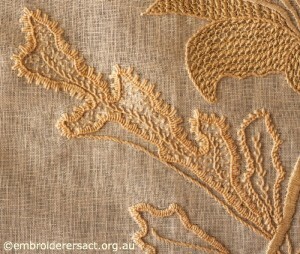 This design has adapted the original design to surface embroidery using linen fabric and coton a broder. 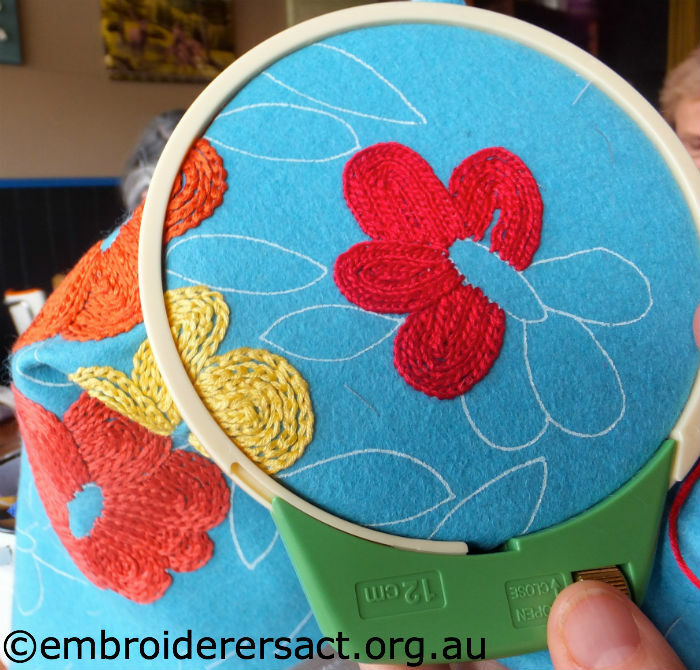 Let’s have a closer look…. 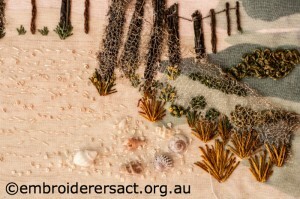 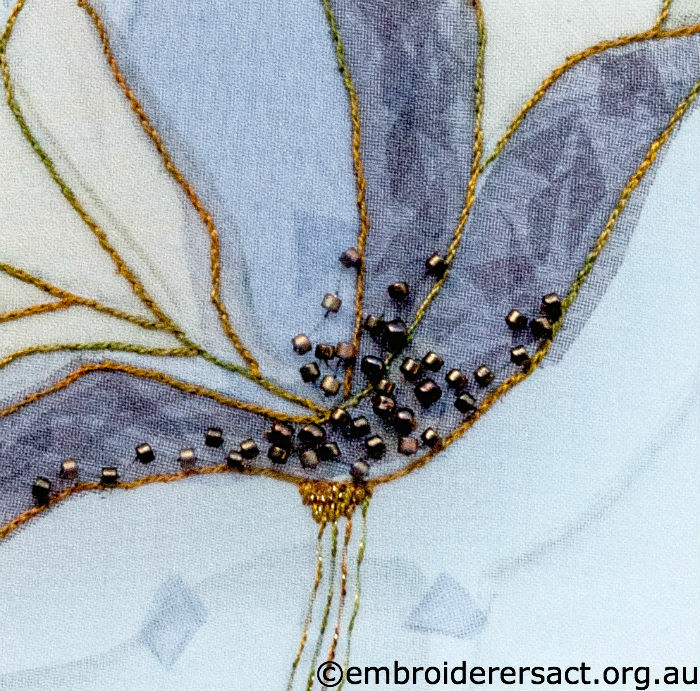 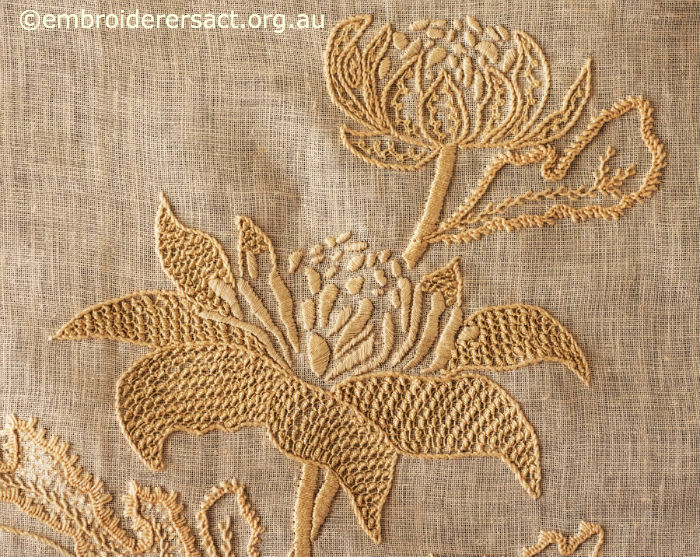 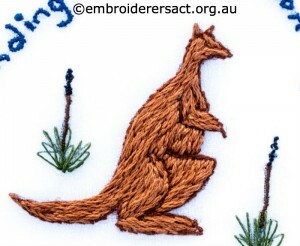 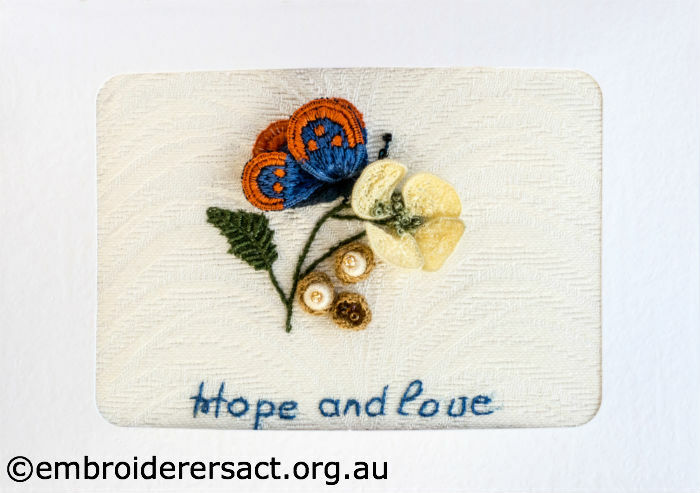 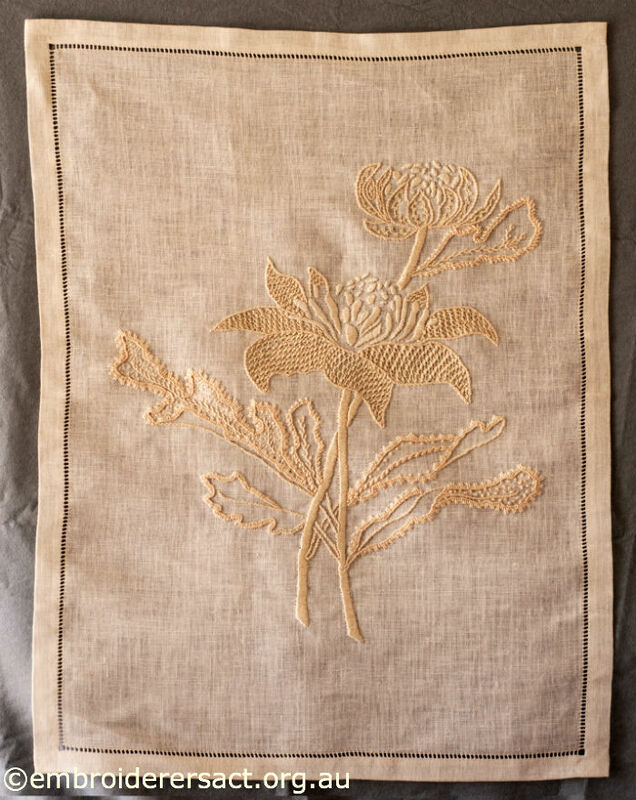 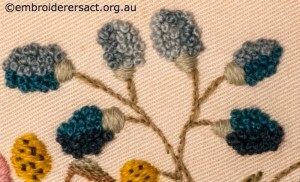 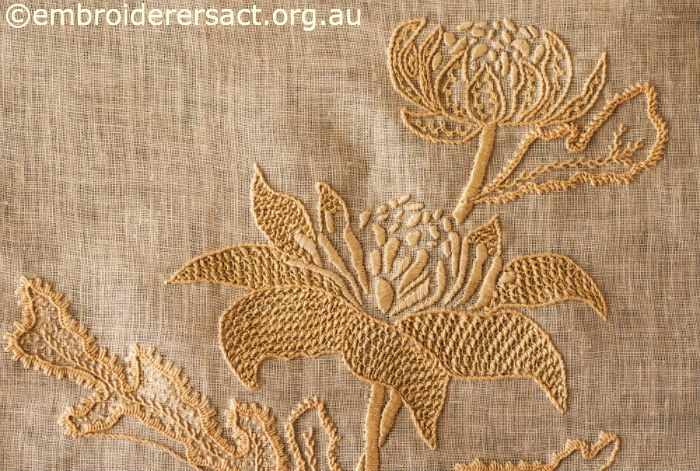 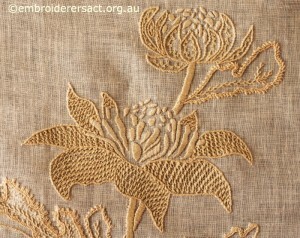 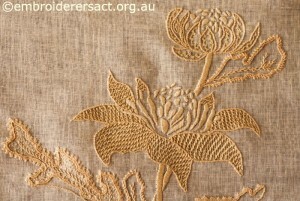 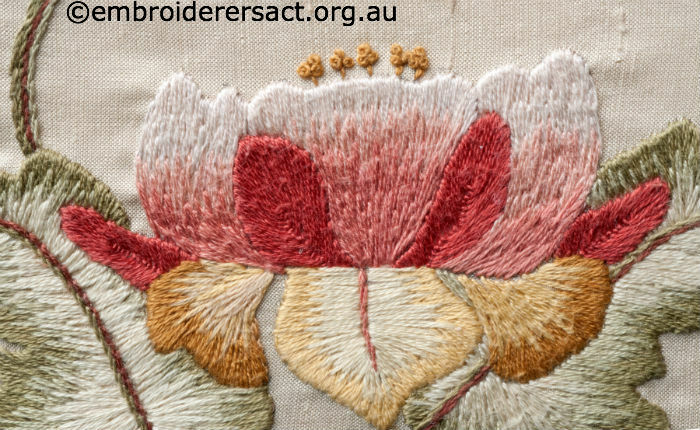 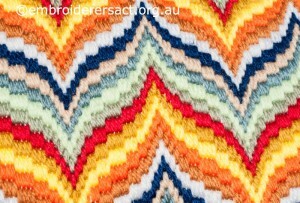 If you look at the main Waratah flower the central area is embroidered in Padded Satin Stitch. 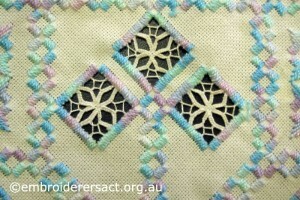 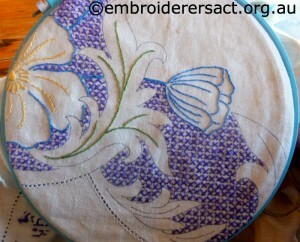 The petals are outlined in Stem Stitch and filled with needlelace in Sixteenth Lace Stitch. 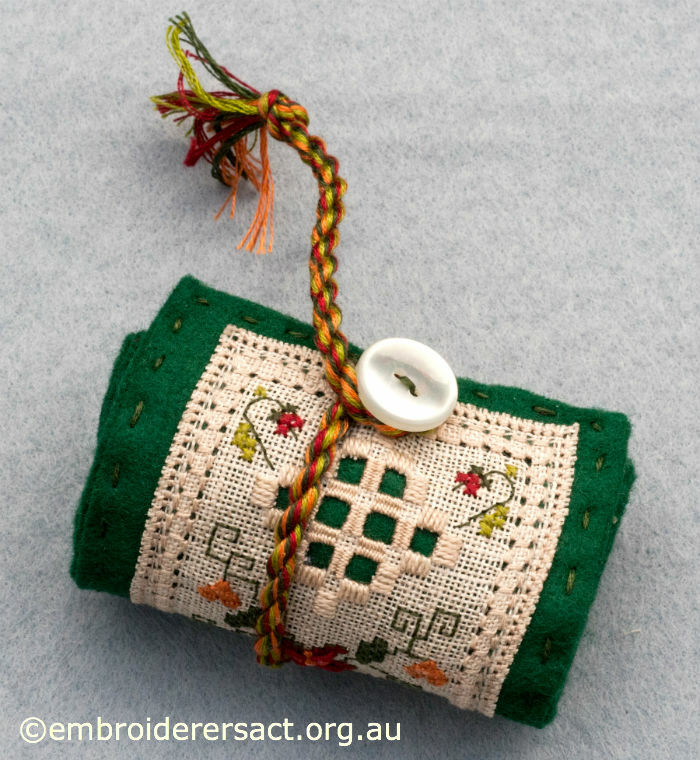 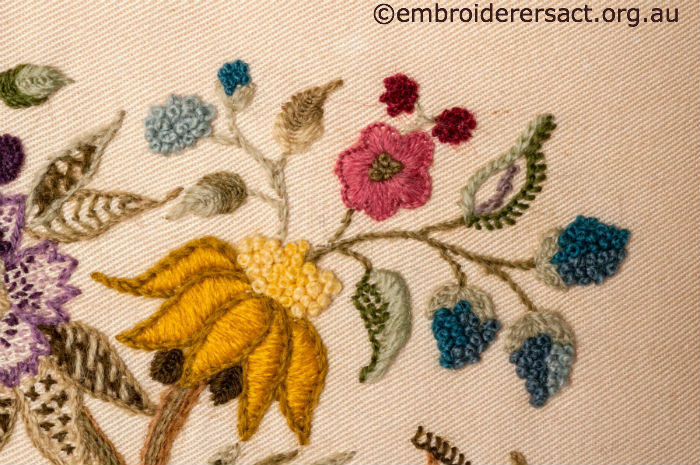 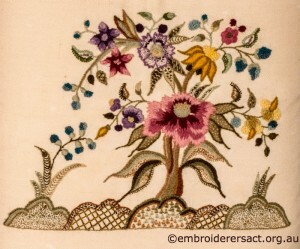 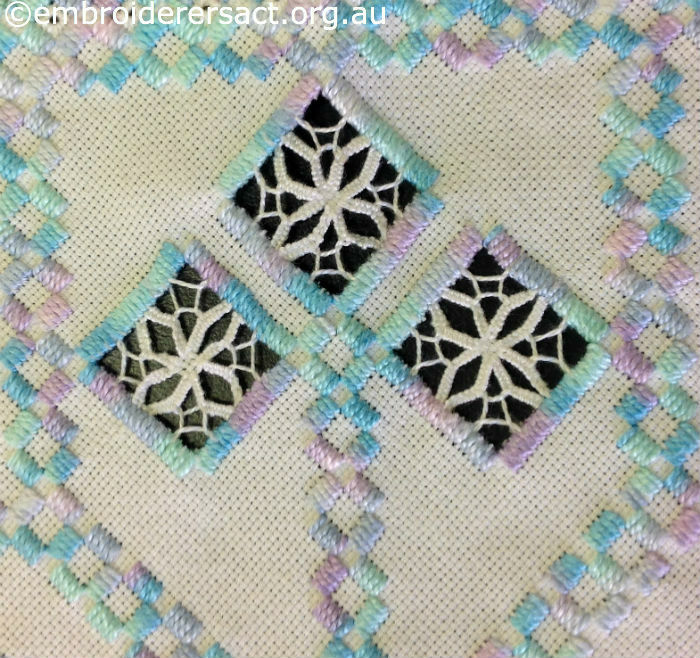 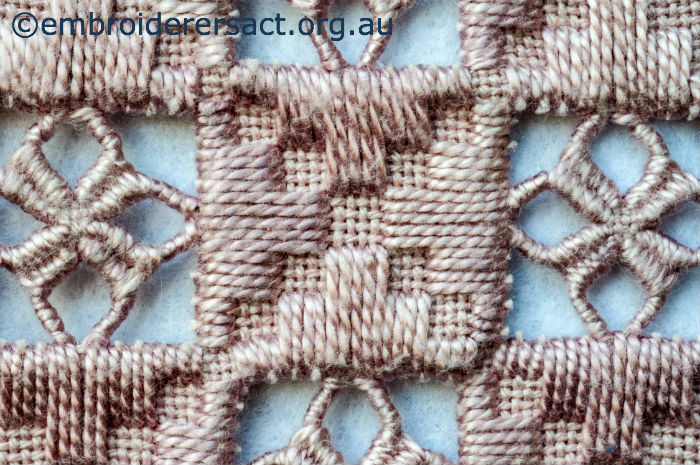 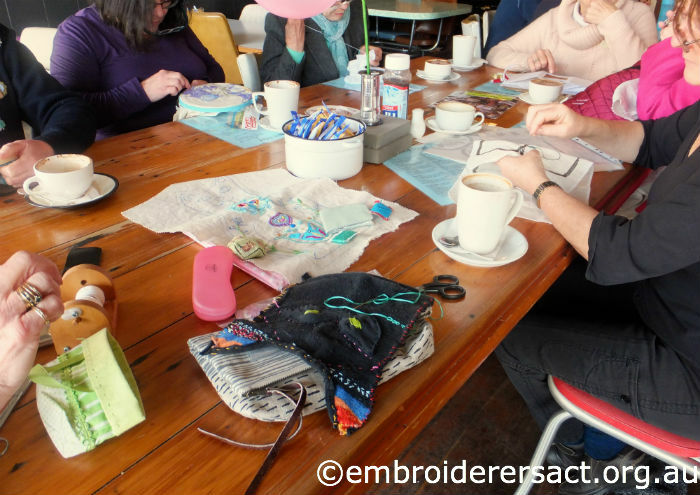 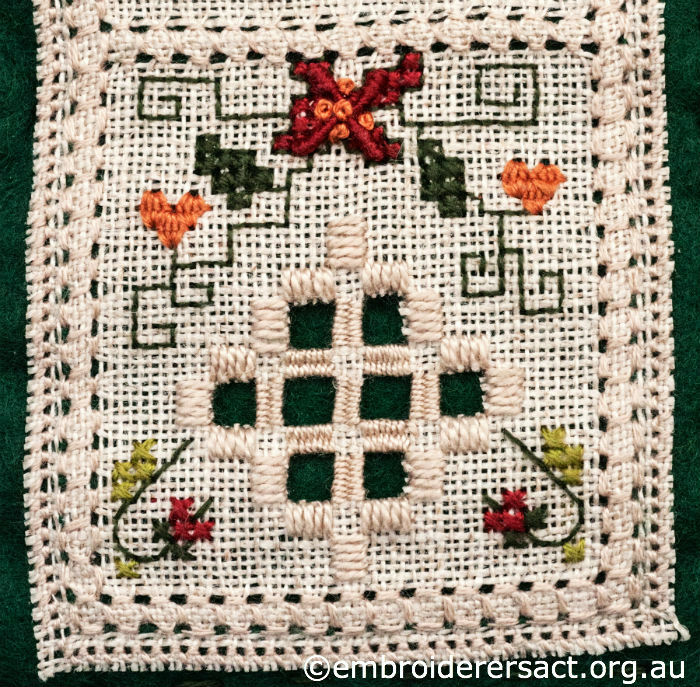 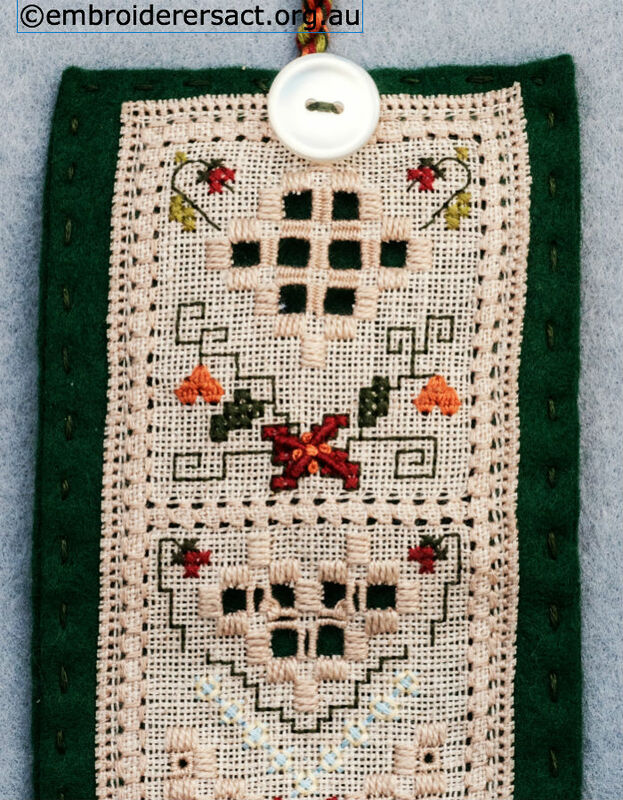 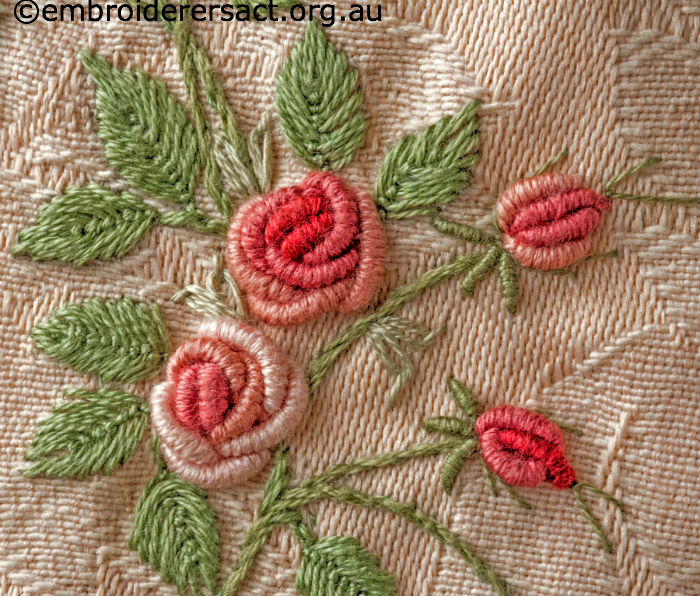 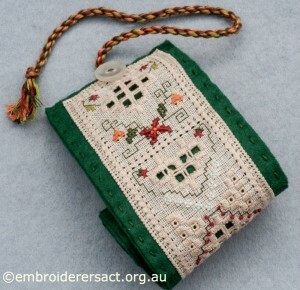 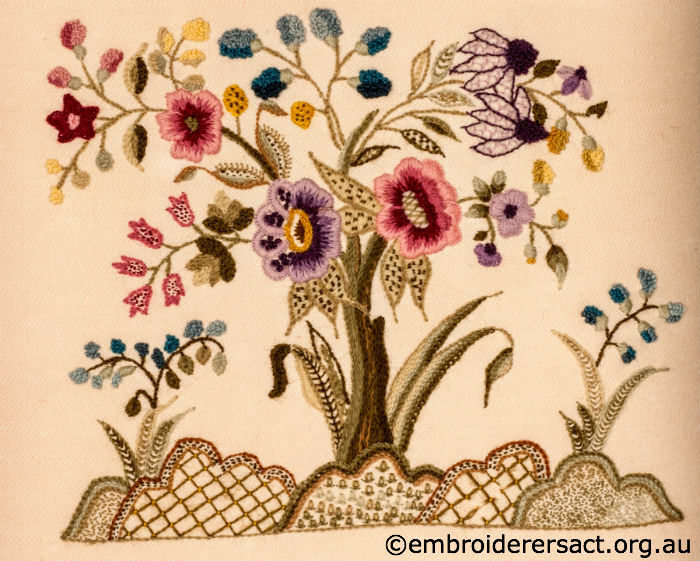 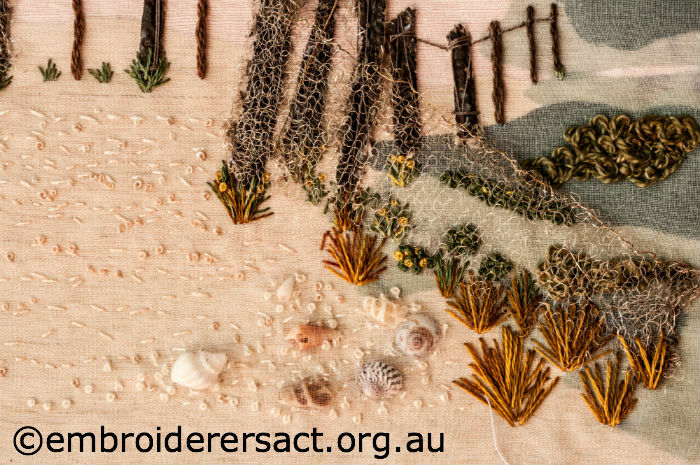 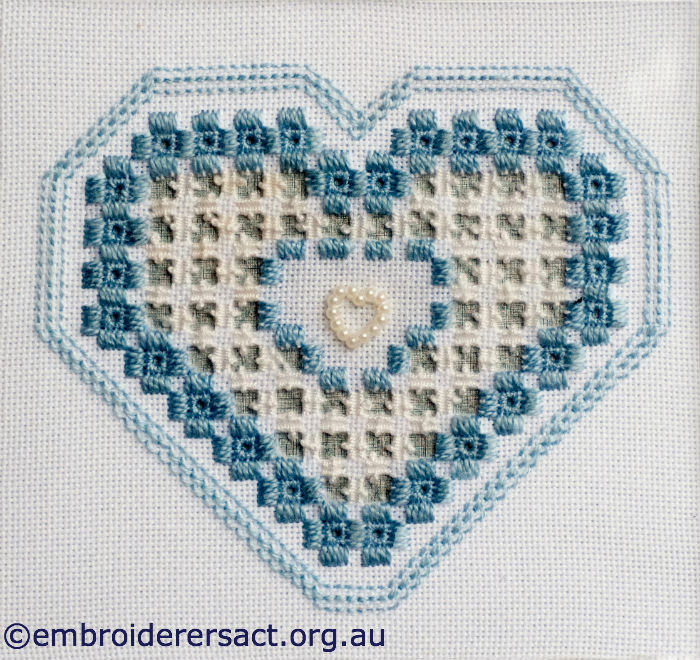 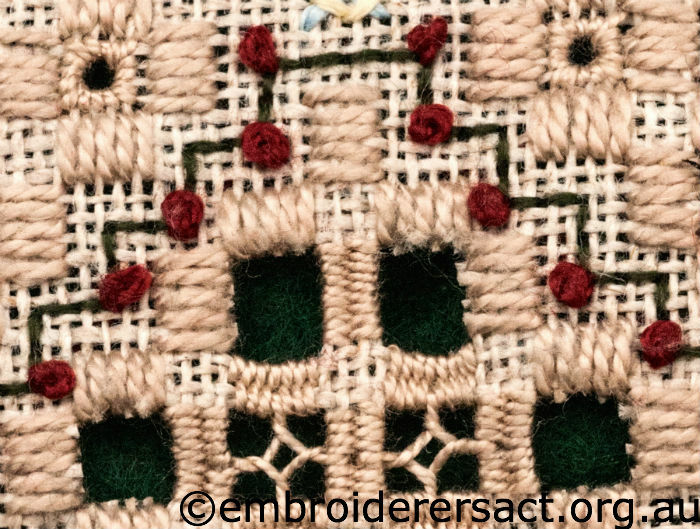 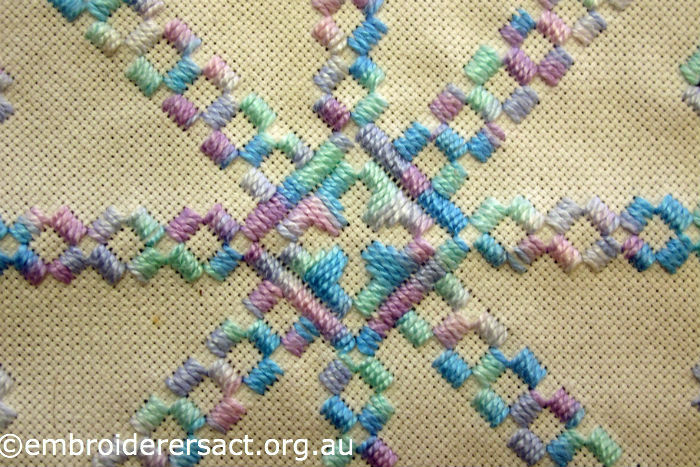 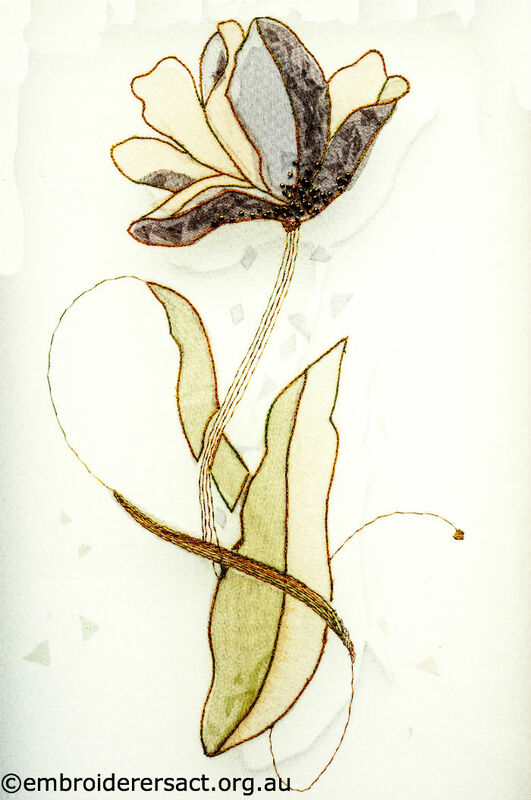 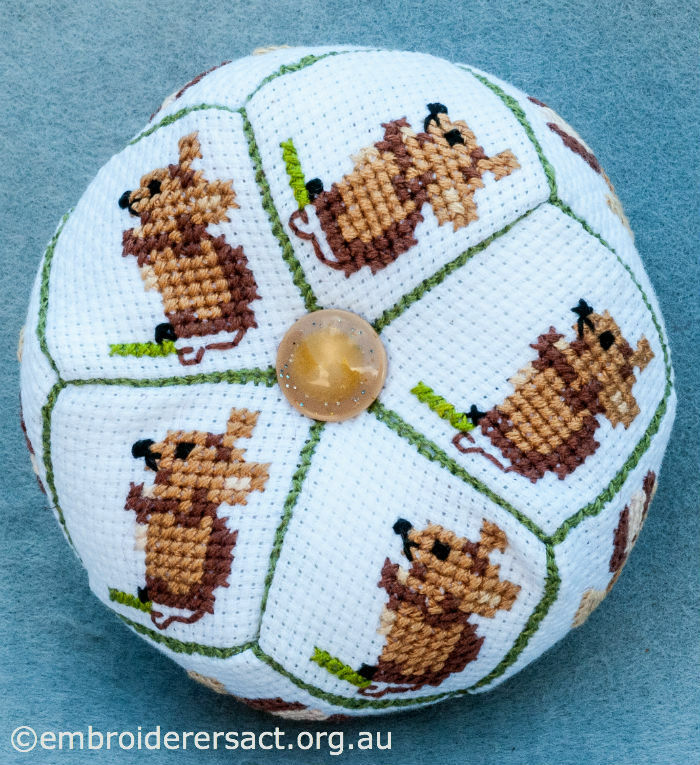 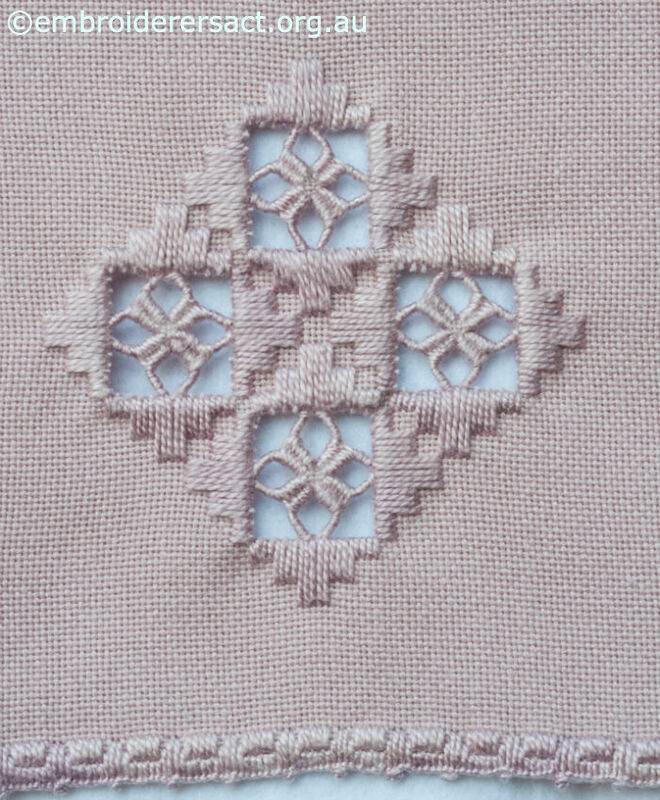 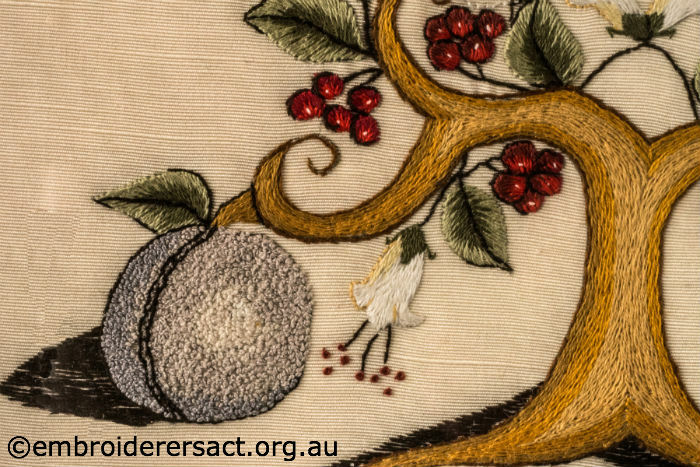 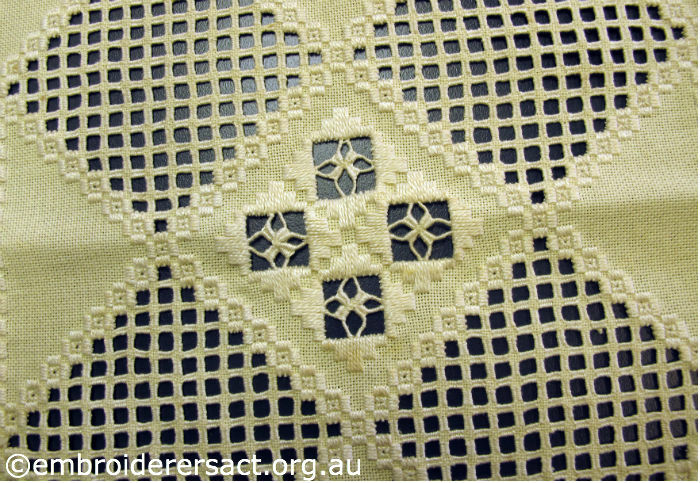 Ann – Marie Bakewell notes that in researching the original embroidery by Miss Docker she found this stitch in the Encyclopedia of Needlework by Therese de Dillmont. 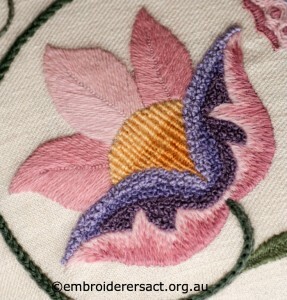 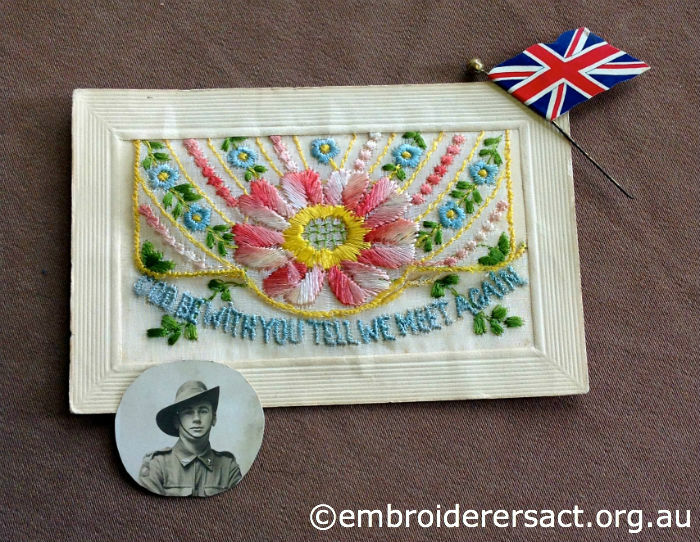 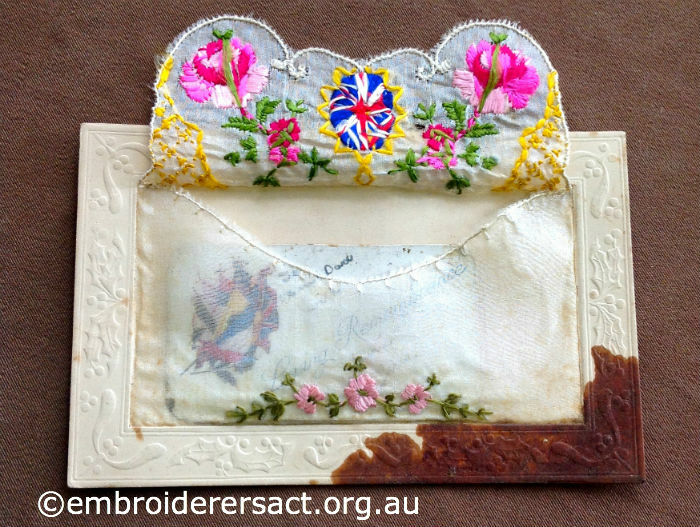 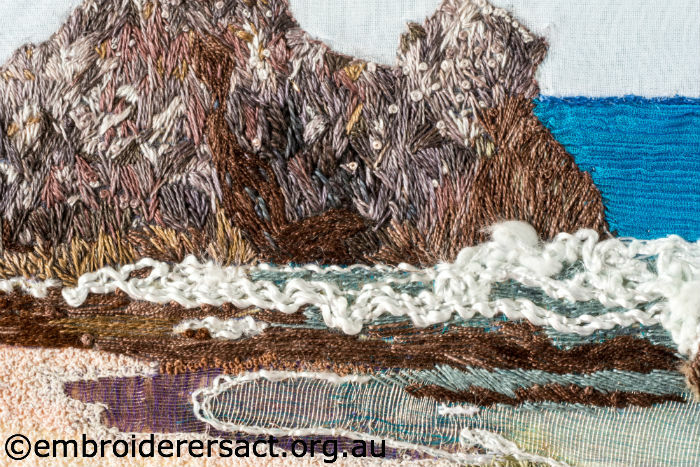 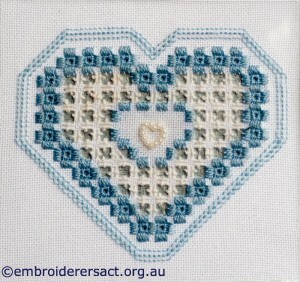 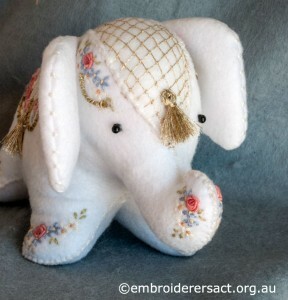 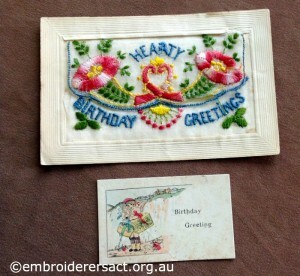 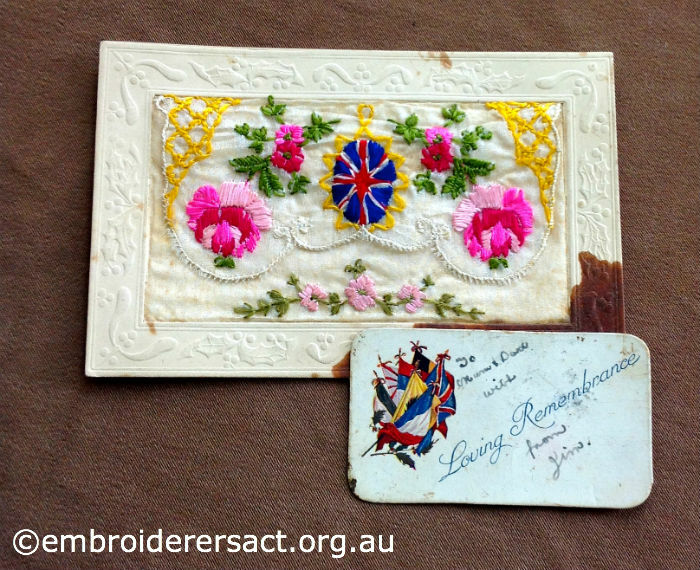 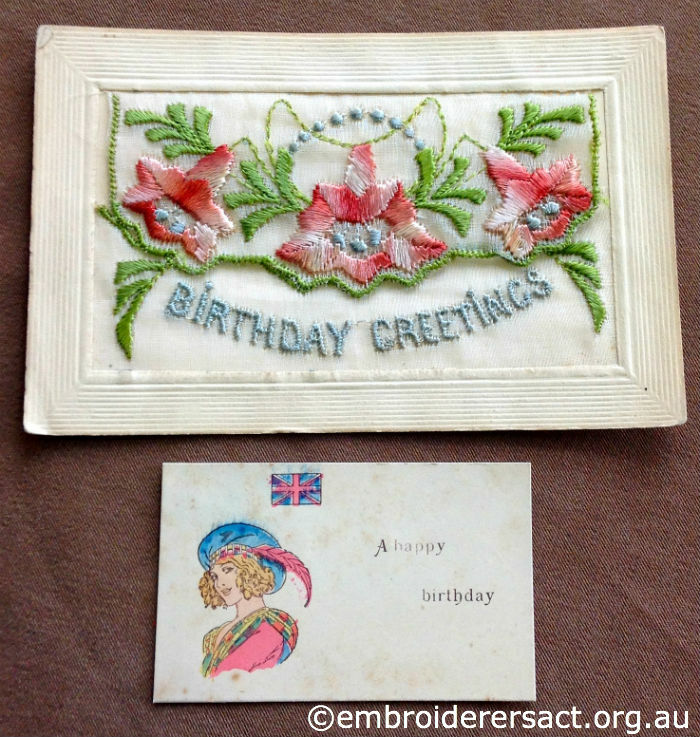 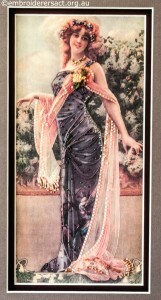 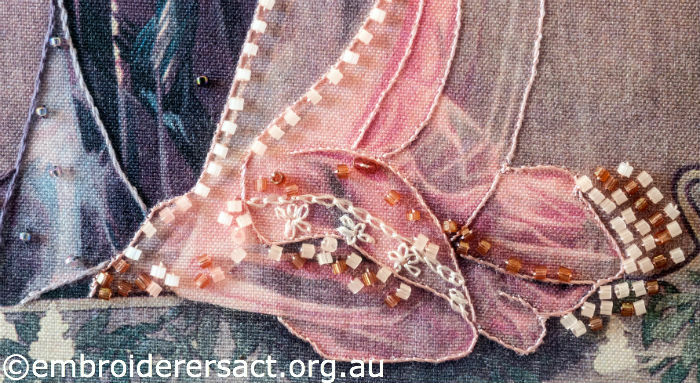 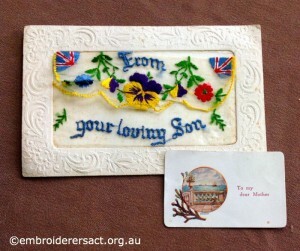 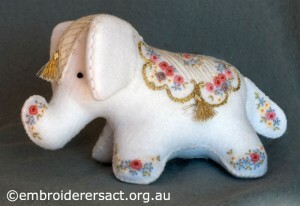 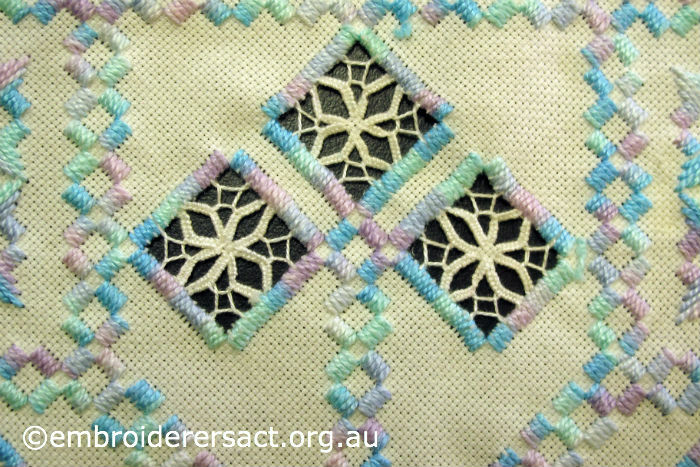 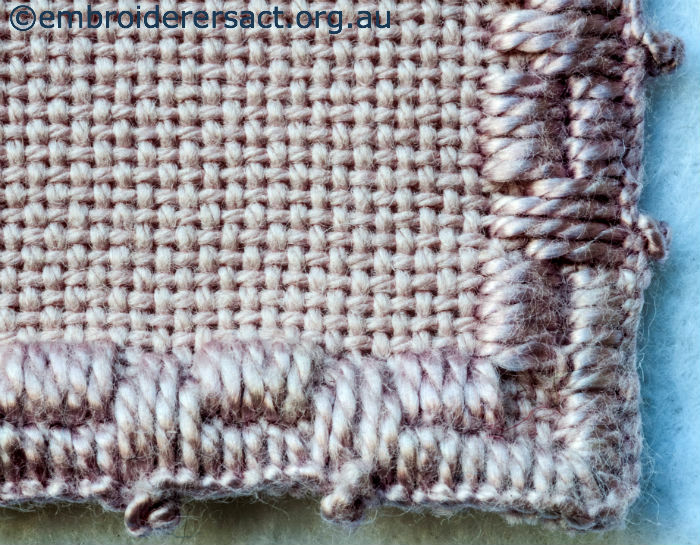 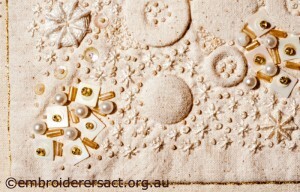 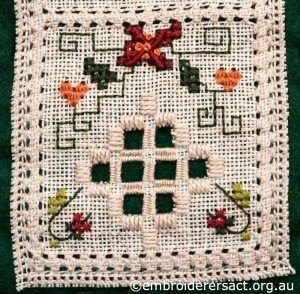 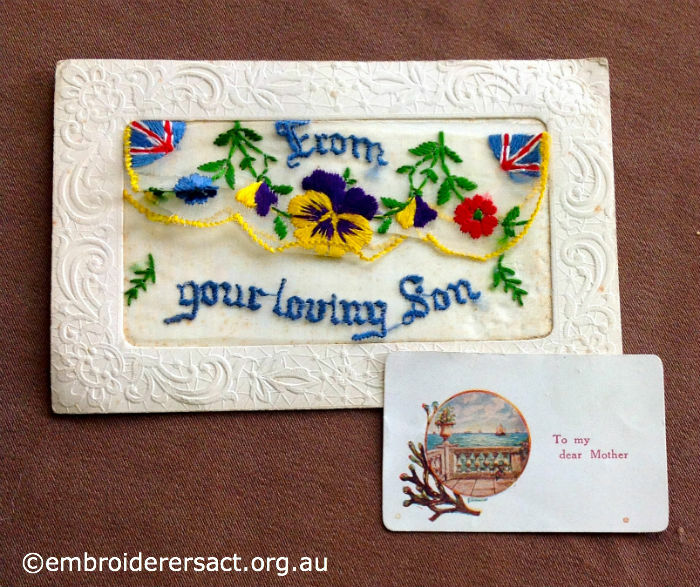 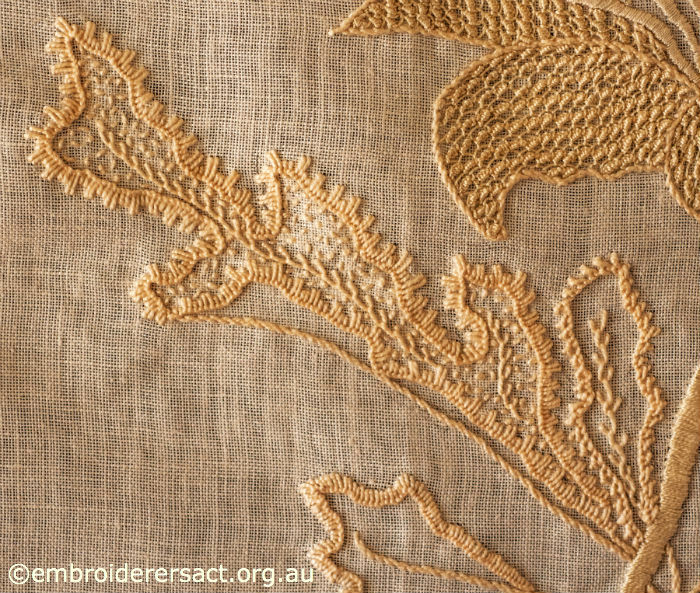 This was one of the few embroidery reference books available in Australia when this piece would have been stitched. 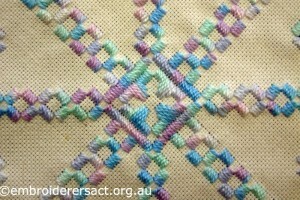 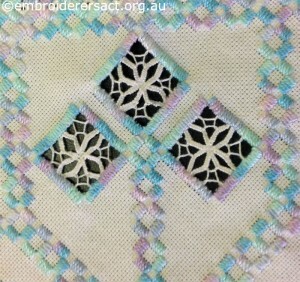 What do you think of Sixteenth Lace Stitch? 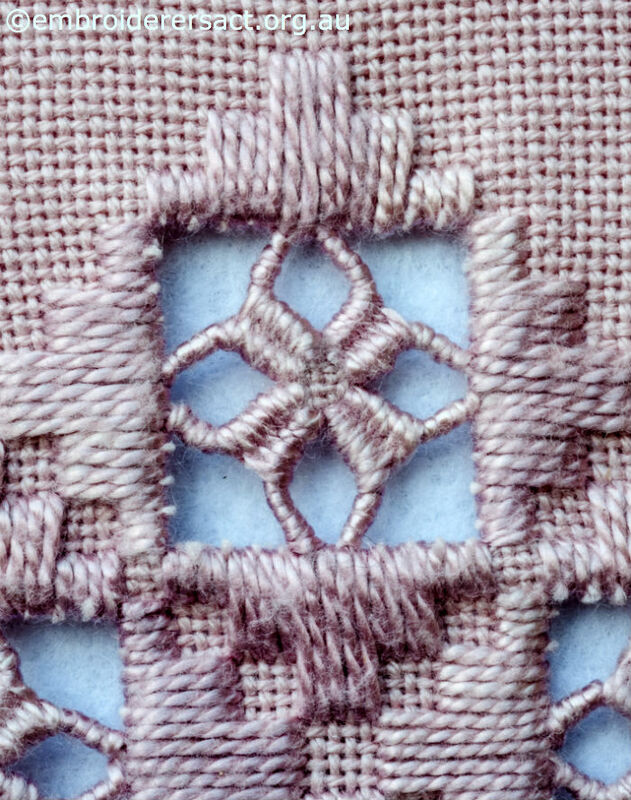 I’m just blown away by it and can’t wait to learn it. Now to the Waratah bud…. Again the central element is Padded Satin Stitch slanted at various angles. 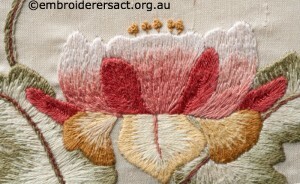 The petals are outlined in Stem Stitch and then filled with Laced Herringbone Stitch. 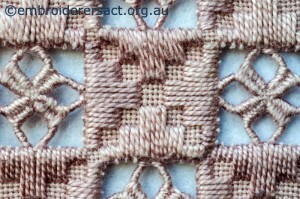 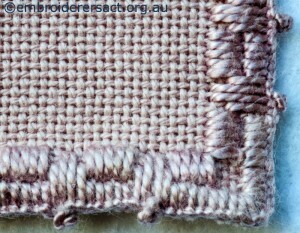 The centre spine of the leaf on the right is worked in Feather Stitch and the outline of the leaf in Crossed Buttonhole Stitch at right angles to the edge. 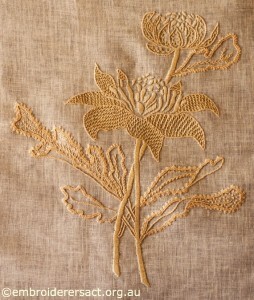 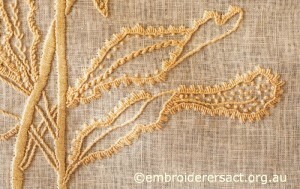 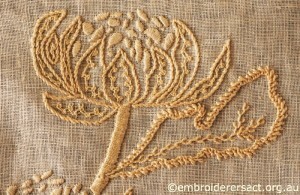 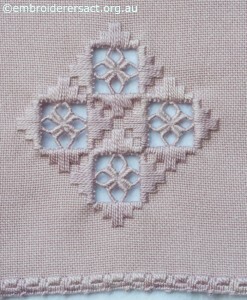 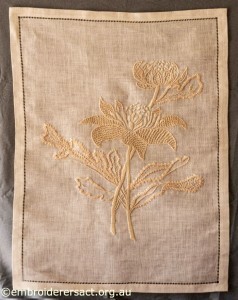 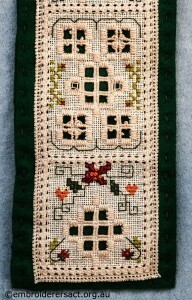 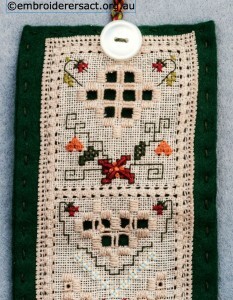 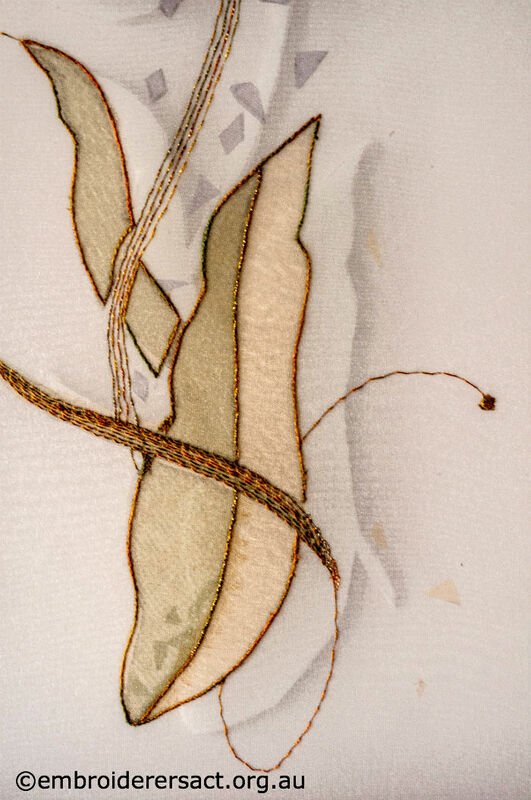 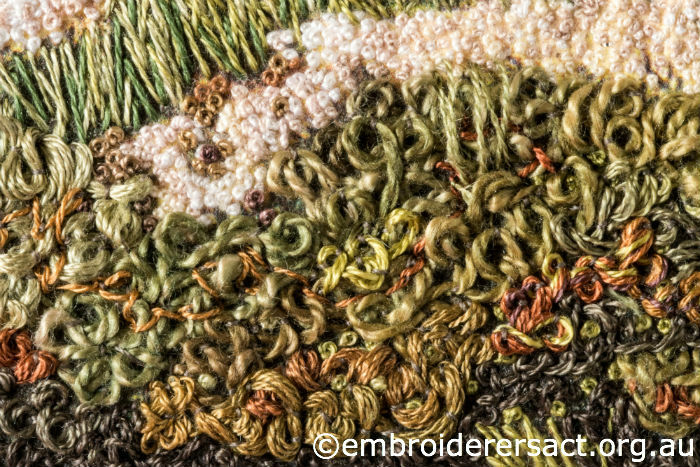 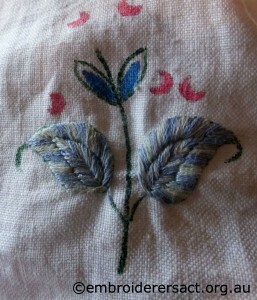 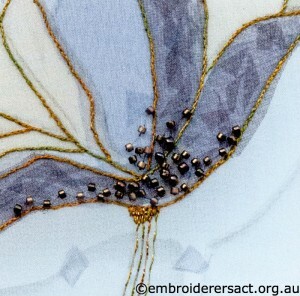 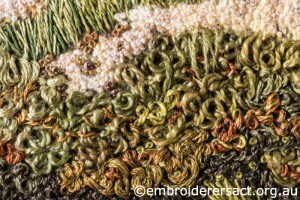 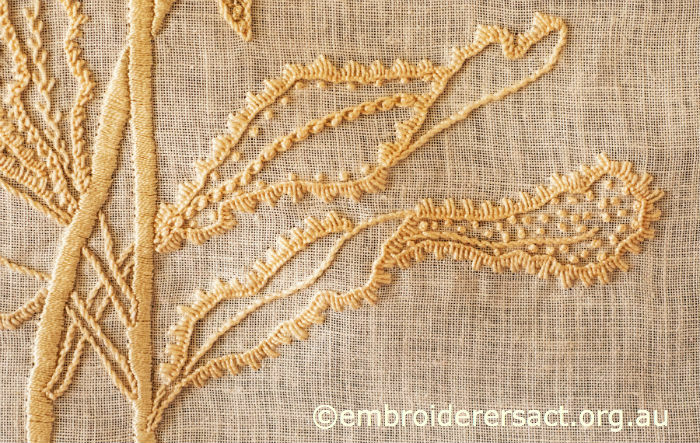 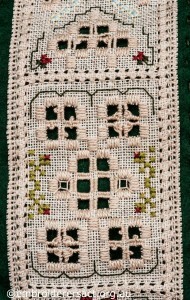 In the large leaf above the long centre line is stitched in Slanted Buttonhole Stitch and surrounded with Seed Stitch. 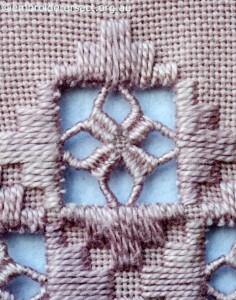 The outline is Indented Buttonhole Stitch. 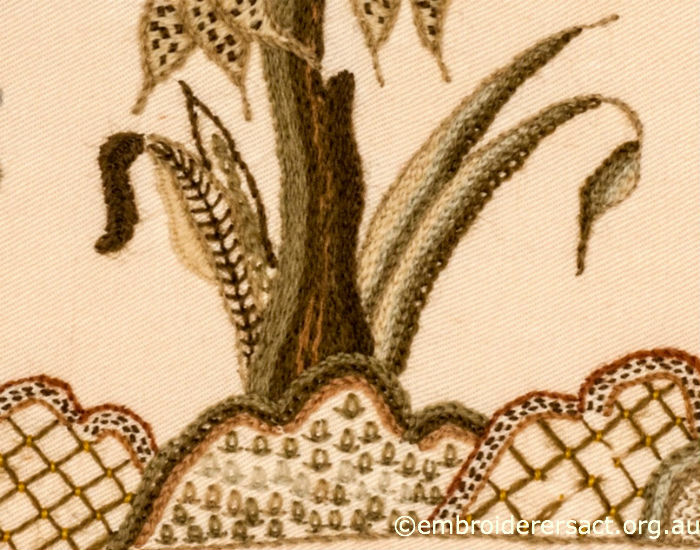 The smaller leaf to the right in the above photo has Feather Stitch down the centre and Crossed Buttonhole Stitch along the outer edges. 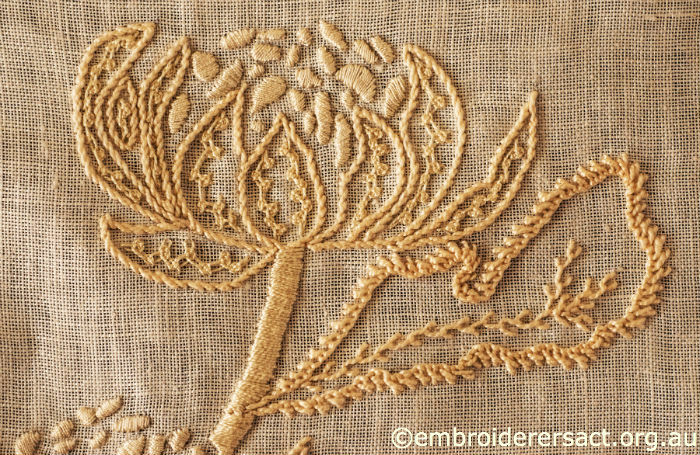 I was intrigued by these two leaves and the use of Oyster Chain Stitch (also called Knotted Cable Chain Stitch) to define the centre line of the top one – just awesome. 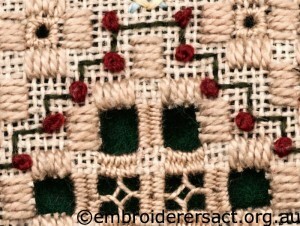 The Sawtooth Buttonhole Stitch along the outline of this leaf is also incredibly effective. 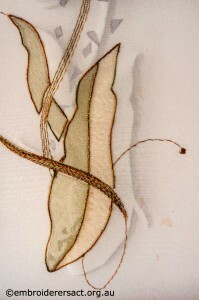 Both these leaves have very clever placement of closed and open spaces to create shape and directional change. 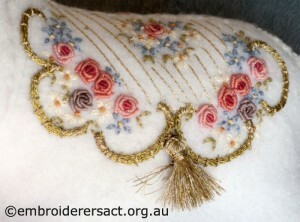 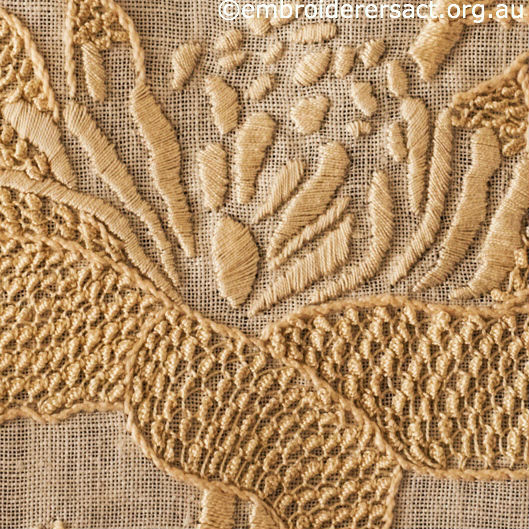 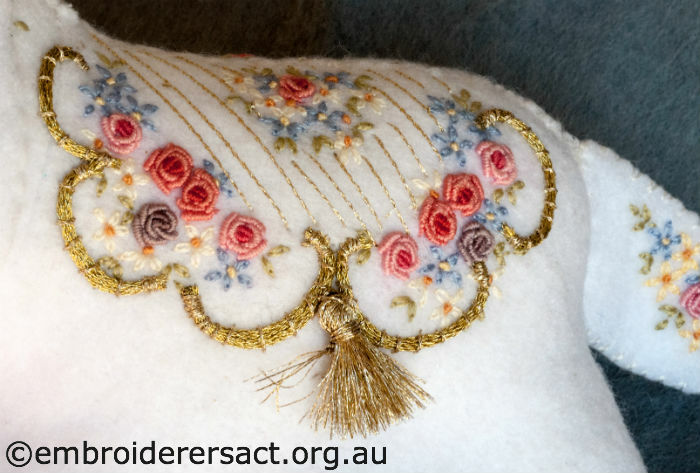 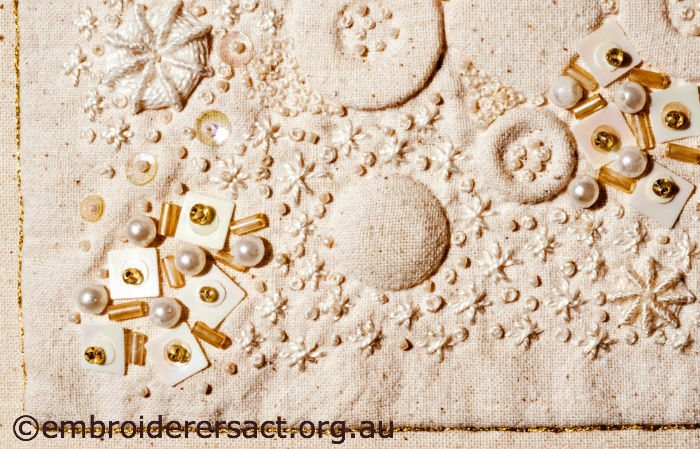 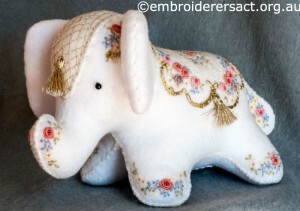 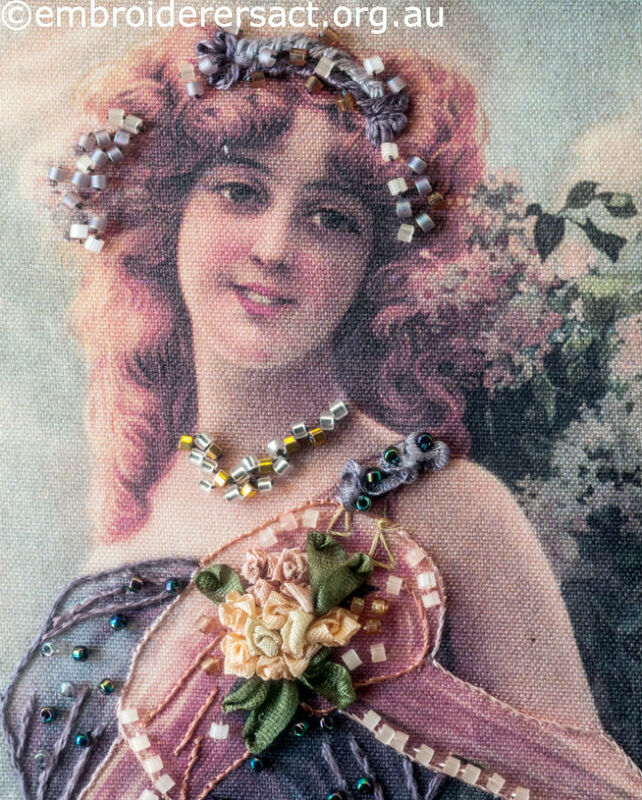 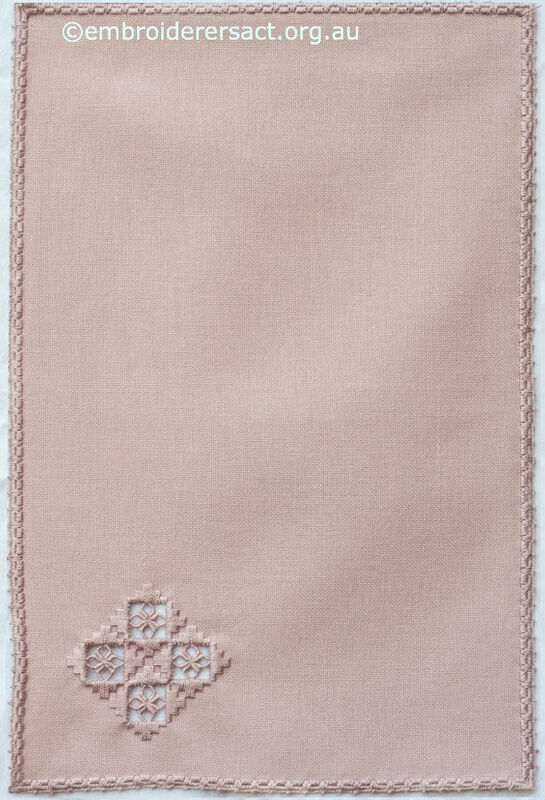 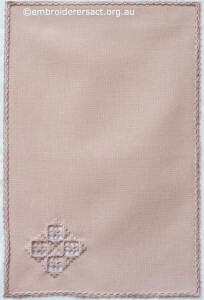 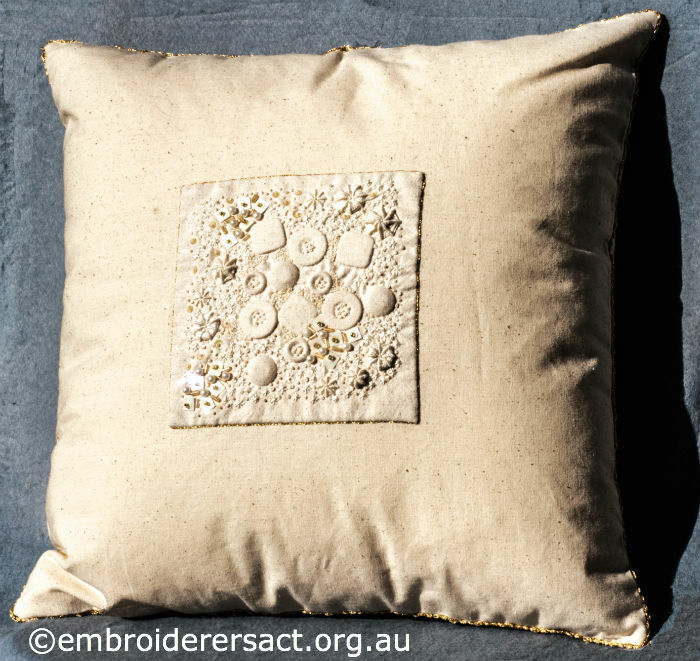 The French Knots provide a delicate decorative effect. 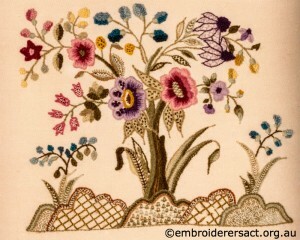 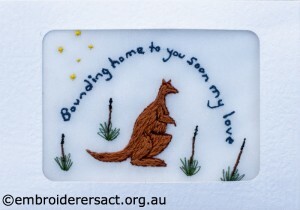 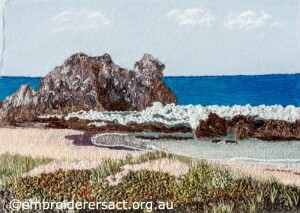 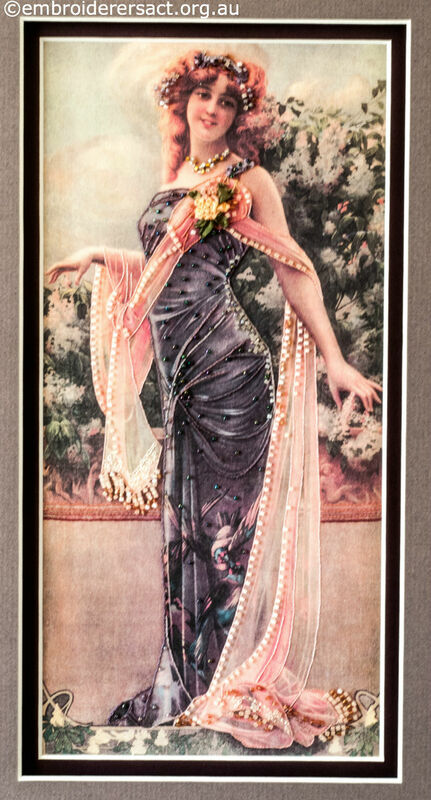 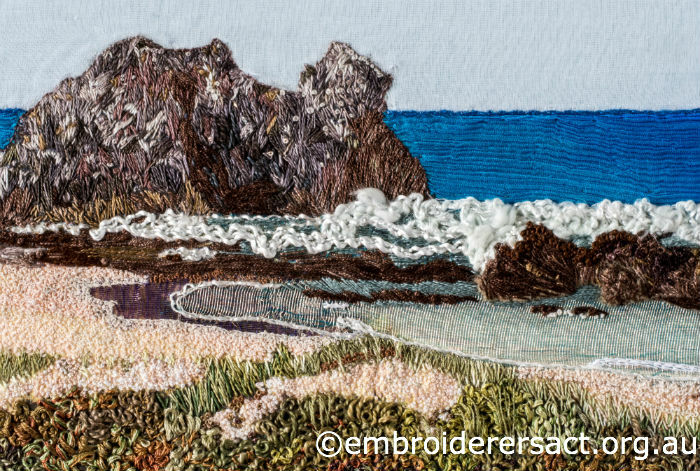 Marjorie thank you so much for sharing this stunning needlework with us. 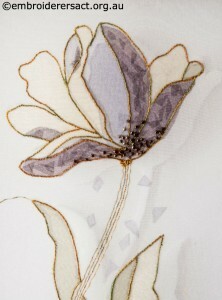 As you can tell I just adore this piece – hope you enjoy it too! 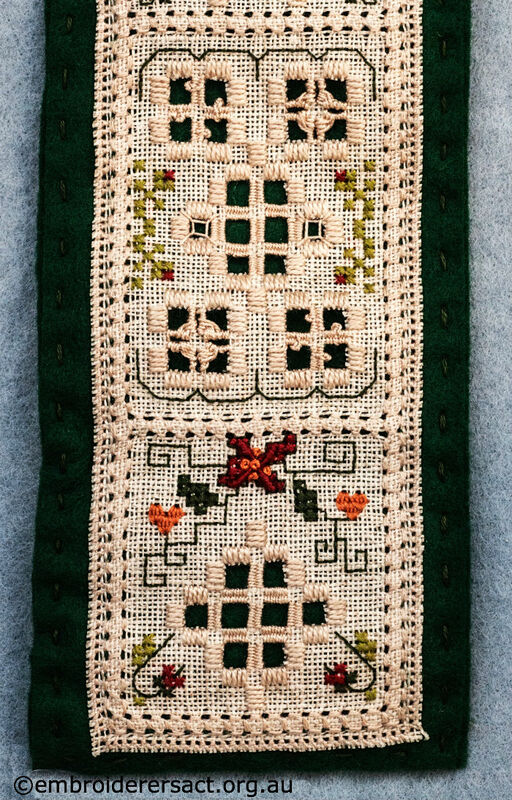 Earlier this year in April you enjoyed two cushions in the Aran style by Audrey Schultz in this blog post. 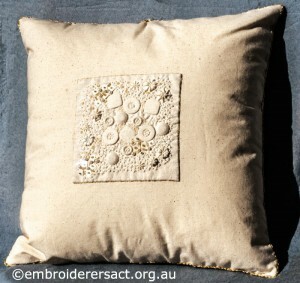 Now here are two lovely crewel cushions stitched by Audrey with the same flair, talent and technical skill. Thank you so much Audrey for sharing these beauties with us.